Do what is possible : Whatever you do, don't take the easy way out. Do it to the best of your current abilities. In my case, part of it means take the time to draw well. Drive possible : Be consistent with your work, do it everyday. In my case, this means draw something everyday. It definitely develop skills. The more I draw the better I get. 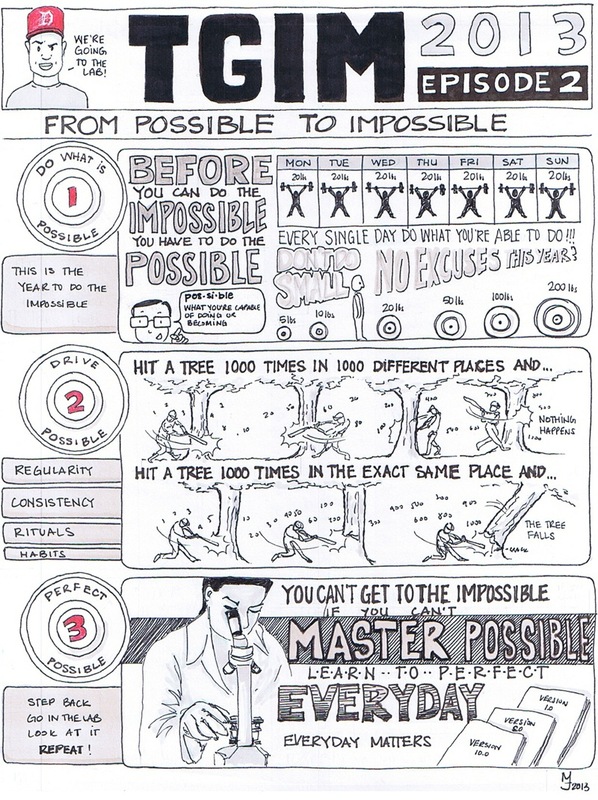 Perfect possible : Take a step back and look at how you can improve your own work on a daily basis, and make the necessary changes to your routine. This is pretty much what I did for this sketchnote. I looked at the previous one, saw a couple things I could improve and implemented the changes. Another powerful illustrative summary of ET's TGIM Episode MJ. I really like how you created the weekly calendar for step 1 and how you have the different versions for the lab reports. I just shared both of your illustrations on my blog about ET's quotes too. Thanks for creating these - Looking forward to more illustrations! Thank you Parin for your comments, I really appreciate it.